Experiment cards are a major addition to the main game, and symbolize the Paths' efforts to influence the time and effect of the incoming Impact. 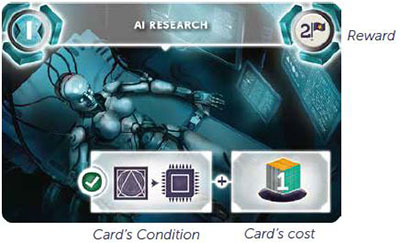 Each Experiment card consists of a condition, a cost and a Victory Point reward. While in Focus, they can be claimed by using the new Experiment Action on the Main board. Each Experiment grants Victory Points to the player who claimed it, as well as a chance to advance on the Doomsday track according to the Path's interests - either towards saving Earth by mitigating the Impact's damage, or sealing the planet's fate. Depending on the movements on the Doomsday track, the Paths can score additional VPs for their Experiments, and even the time of Impact can change. 1 Place the Impact tile between the fifth and sixth Timeline Tile (instead of the fourth and fifth). 2 Once the Timeline has been laid out, place a random face-up level 1 Experiment card below the first Timeline tile, and a face-down Level 1 Experiment card below each other Timeline tile. Return the leftover Level 1 Experiment cards to the box without looking at them. 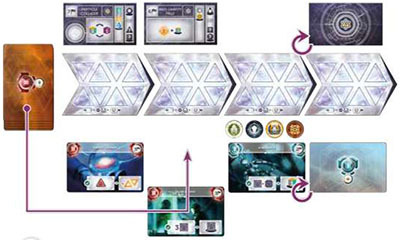 At the start of the game, the first Timeline tile should have a face-up Superproject above and a face-up Level 1 Experiment below it, while all other Superprojects and Experiments should be face down. 3 Place the Doomsday board next to the Main board. Treat this as part of the Main board. 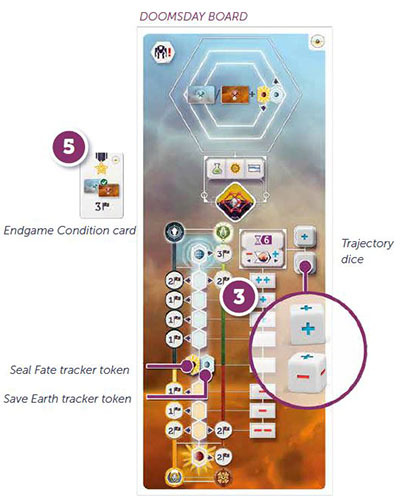 Place the Trajectory dice on the designated slots on this board, and the Save Earth and Seal Fate tracker tokens on their respective starting positions on the Doomsday Track. 4 Shuffle all level 2 experiment cards into a face-down stack and place it next to the Doomsday board. 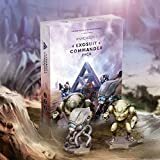 5 Before choosing the 5 random Endgame Condition cards, add the "Most Completed Experiments" card to the card pool. After flipping the Superproject above the following Era's Timeline tile, also flip the face-down Level 1 Experiment card below it. Then, place a face-up Level 2 Experiment card from the top of the stack below each Timeline with no Experiment card below it. The Doomsday module introduces a new Main board Action: the Experiment. you pay the experiment card's cost. Remove it from below the Timeline tile and place it next to your Player board as a reminder. Receive a number of VP tokens indicated on the Experiment card (2 or 3), and potentially additional VPs depending on your position on the Doomsday track. If you play the Path of Harmony or the Path of Dominance, you may move the "save earth" tracker one step up on the Doomsday track. If you play the Path of Salvation or the Path of Progress, you may move the "seal Fate" tracker one step down on the Doomsday track. The Experiment Action can be taken by any Worker. Experiment has a Hex Pool space, where any number of Workers can be placed. Whenever a player conducts an Experiment, he may move either the "Save Earth" tracker one step up, or the "Seal Fate" tracker one step down, depending on his Path. 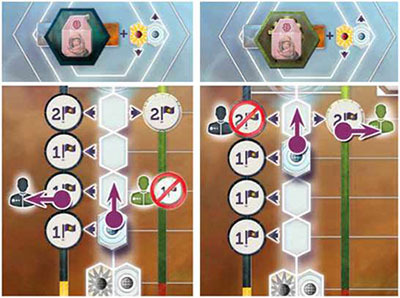 After this movement, if there is a Victory Point value printed next to the spot associated to the Path that moved to the new spot (see the Path symbols in the four corners), that player receives that amount of Victory Points in addition to the claimed Experiment's Victory Point value. Only the player that moved the tracker may gain Victory Points from the Doomsday track. The Paths of Harmony and Salvation receive larger amounts of Victory Point for the last two steps in each direction, while the Paths of Dominance and Progress receive smaller amounts of Victory Points for the initial steps. either the "Save Earth" or the "Seal Fate" tracker is on the final (top or bottom) slot of the Doomsday Track. Even when any of the above is true, Experiments may still be conducted for their VP values. next to the Doomsday track slots where the "Save Earth" and "Seal Fate" Trackers currently are. If there are more + symbols in total than -, move the Impact tile 1 space to the right on the Timeline track if possible - the Impact will occur one Era later. 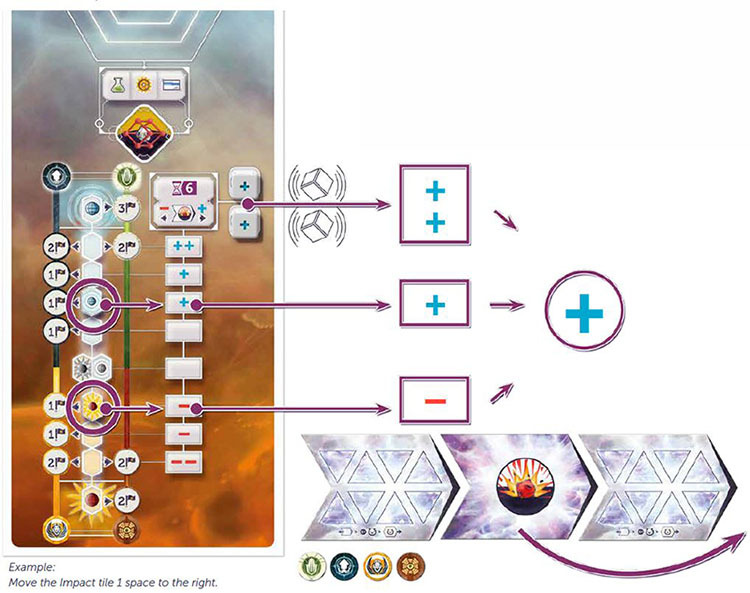 If there are more - symbols in total than +, move the Impact tile 1 space to the left on the Timeline track - the Impact will occur one Era earlier. If this would move the Impact tile behind the current Era tile, do not move the Impact tile. If the number of - and + symbols is equal, do not move the Impact tile. Important: If the "Seal Fate" tracker is on the bottom most spot of the Doomsday track during the Check for Impact phase, do not roll the Trajectory dice - instead, place the Impact tile after the current Timeline tile (regardless of its position) and resolve the Impact immediately. Important: If the "Save Earth" tracker is on the topmost spot of the Doomsday track, the Impact's damage to the present is completely mitigated, and the game is over - proceed to the final scoring. In games when earth is saved, the Impact is never resolved, so there will be no evacuation - try to adjust your game plan accordingly! These optional rules are meant for players who are already familiar with the Doomsday module, and prefer planning their Experiment Actions ahead. Place the Level 2 Experiment stack face up next to the Doomsday board (instead of face down). The top Level 2 Experiment card will always be visible for everyone. Whenever a player claims an Experiment card, immediately replace it with the top Level 2 Experiment from the stack, until the Experiment stack runs out. During the Preparation phase, do not place any Level 2 Experiment cards under the Timeline.